East Haven’s Giro Esposito slides into second base as Anthony Burzynski of Branford, center, waits for a throw from teammate Jake Bodner on Friday. 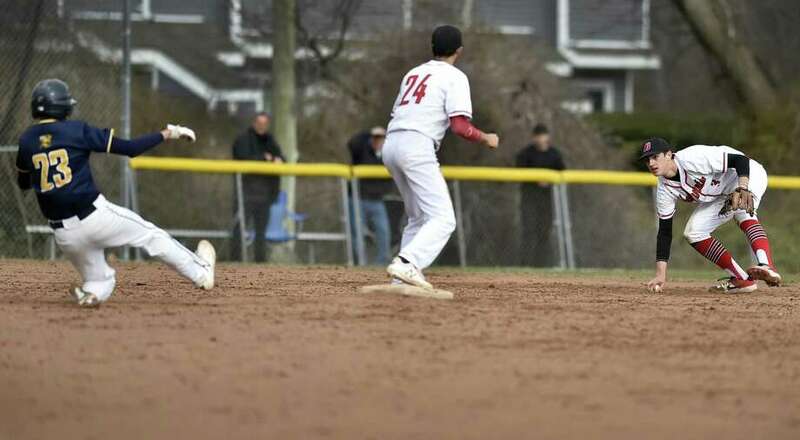 Nate Furino went 3-for-5, including two doubles, with three RBIs and two runs and earned the complete-game victory for the East Haven baseball team, which defeated Branford 8-3 Friday in a Southern Connecticut Conference game at Branford. Hunter Santana went 2-for-4 and scored three times for the Yellowjackets, who jumped out to a 7-0 lead. Carter Shannon had two hits and Mason Traca added two RBIs for the Hornets. Wilbur Cross 3, Law 2: Angel Galindez allowed two hits over six innings, striking out nine, for Wilbur Cross (4-1) in a SCC victory at New Haven. Fernando Doria earned the save for the Governors. Ansonia 7, Seymour 4: Ricky Torres pitched 61/3 innings, struck out 12 and helped himself at the plate with three runs scored to lead the Chargers to their NVL win. Garrett Cafaro had two hits and four RBIs, including a two-run home run, and scored three runs for the Chargers. North Haven 6, Xavier 1: Dave Christoforo and Reid Kankel both homered in the bottom of the third inning for North Haven in an SCC home win. Jason Mazzaro struck out five to earn the victory for the Indians. Luke Lappe homered for Xavier. Hand 8, West Haven 2: Phoenix Billings tripled, homered, drove in five runs and had 11 putouts at shortstop for hand in a SCC win at Madison. Will Kleinhenz singled and scored three runs for the Tigers (4-1). Michael Boni had two RBIs for West Haven (2-3). Cheshire 7, Lyman Hall 1: Matt Downing went six innings, allowed no runs and struck out 15 to lead the Rams to their SCC win in Cheshire. Ian Batipaglia went 3-for-4 with four RBIs to lead the Rams’ offense. Westbrook 8, East Hampton 7 (8): Quinn Ernst’s RBI single scored Kyle Robison in the bottom of the eighth inning for Westbrook in a walk-off Shoreline Conference home win. Records: Sheehan 2-3, Amity 4-1. Batteries: S—Cordes (L) and Leone; A—Lumpinski (W, 2-0) and Crow. Highlights: S—Cloutier went 2-for-3 with one RBI. A—Lumpinski struck out seven. Holt went 1-for-3 and drove in the game-winning run in the sixth. Records: Norwalk 1-4, Warde 2-4. Batteries: N—Michael Boyian (L), Myles Andriopoulos and Jaden Echevarria; W—Mason McKay (W, 1-0), Harry Graney Green (S) and Finn Mobley. Highlights: N—Gavin Kee had one hit, one run scored and three RBIs. Kyle Gordon scored two runs. W—McKay had two hits, including a bases-clearing double. Sam Vincent hit a RBI-sacrifice fly, walked and scored one run. Austin Stewart scored three runs. Records: Foran 5-1, Guilford 1-5. Batteries: F—Tyler Griffin (W, 1-0), Jack Greenspan and Sam Sinisgalli; G—Zack Sampson (L, 0-3), Kevin Ciardiello, Cade Pascale, Mike Torre and Josh Wettemann, Julian Scarpa. Highlights: F—Shane McCone went 2-for-3, including a grand slam, with six RBIs. James Carbone hit a RBI-double. G—Jake Palmer and Jake Ciocca each had one hit. Records: Stratford 2-3, ND-Fairfield 5-1. Batteries: S—Mike D’Aloia (L), Zach Demanche (5), Malcolm Kinder (7) and RJ Burlone; NDF—Richie Kerstetter (W), Josh Ortiz (5) and Ruben Ramirez. Highlights: S—RJ Burlone had two hits, including a solo home run. Logan Zezima went 2-for-2, including a double. NDF—Kerstetter went 3-for-4, including two doubles, with two RBIs and one run scored. Josh Ortiz went 3-for-4, including a double, with one RBI and two runs scored. Ramirez went 2-for-4, including a double, with three RBIs and one run scored. Records: Ludlowe 6-0, 3-0 FCIAC; Stamford 1-3, 0-3. Batteries: L—Matt Micinilio (W, 1-0) and Blake Benway; S—Ross Green (L) and Lucas Wirz. Highlights: L—Brian Howell hit a RBI-triple. Greg Calabrese had two hits and one RBI. Micinilio struck out seven. Records: Trumbull 4-3, 1-2 FCIAC. Batteries: R—Matt DeLuca (W), Jack Bohrer (7, S) and Sean Livingstone; T—Justin Nyarady (L, 1-1), Ryan Vawter (6) and Kevin Bruggeman. Highlights: R—Cole Blackwell doubled and scored one run. Livingstone hit a RBI-single. T—Bruggeman had the Eagles’ only hit. Records: Barlow 4-2, Bunnell 1-5. Batteries: Ba—Scott (L), Capetanakis (6) and Andreoli; Bu—Brett Batka (W, 3-0) and Justin Herrera. Highlights: Ba—Paugelli, Lynch, Burrell and Andreoli each had one hit. Scott struck out seven. Bu—Batka struck out six. Ryan Nelson singled and had two RBIs. Josh Kusinski hit a RBI-double. West Haven 4, Law 1: KC Marron has three hits for West Haven, which rallied with four runs in the top of the seventh inning to win this SCC game at Milford. The Westies (7-0) got the runs on three hits and three errors. Ethan Boehm had two hits for Law (3-3). Records: West Haven 7-0, Law 3-3. Batteries: WH—Ivy Santos (W) and Gigi Perreins; L—Brianna Buccitti (L) and Gina Boccamazzo. Highlights: WH—KC Marron had three hits. Santos had two hits. L—Erica-Ethan Boehm had two hits. Hand 6, Shelton 5: Grace Hartmann was 3-for-4 with a triple and scored three times for Hand in an SCC win at Madison. Megan Hart doubled in two runs in the fifth inning to put the Tigers (2-3) ahead for good. Bry Heuser was 3-for-4 with a triple, a double and four RBIs for the Gaels (3-2). North Haven 13, Sacred Heart Academy 0 (5): Peyton Davis homered twice and both GiGi Russo and Eryn Sheeley had round-trippers for North Haven (6-0) in an SCC home win. Lauren Card tossed a one-hitter with 10 strikeouts. Ludlowe 3, Stamford 2: Kylee Holderied hit a RBI-single in the bottom of the ninth inning to give Ludlowe a 3-2 win over Stamford in a FCIAC softball game at Sturges Park Friday afternoon. Allie Clark and Caitlyn Romero each had two hits in the win for the Falcons, who improved to 3-2. Records: Stamford 3-2, Ludlowe 3-2. Batteries: S—Saunders (L) and Amy Covino; L—Kylee Holderied (W, 3-2) and Caitlyn Romero. Batteries: C—Rivera (L) and Velez; SJ—Doiron (W), Hunter (4), Buzzeo (5) and Horton. Highlights: C—Erskine singled. SJ—Charlee Horton went 3-for-3, including a home run, with four RBIs. Kyra McCarthy, Kaitlin Capobianco and Madison Fitzgerald each hit a home run. Batteries: H—Sabrina Outhavong (L) and Desira Morales; KC—Aliyah Santiago (W, 2-0) and Carolyn Marcano. Highlights: H—Morales hit a home run. KC—Sydnee DiNatale hit a grand slam. Janelle Hernandez and Shalese Gordon each had two hits. Records: Norwalk 2-3, 1-2 FCIAC. Batteries: W—Olivia Vadas (W) and Lizzie Kane; N—Mia Lanzarotto (L, 2-3) and Katelyn Greco. Highlights: W—Vadas went 2-for-3, including a two-run double. Avery Yardis went 2-for-4, including a double, with two runs scored. N—Jordan Hogan tripled. Catherine Sheehan singled to score Benni Tucci with the team’s only run. Records: New Fairfield 0-5, ND-Fairfield 4-0. Batteries: NF—Valentine (L), Lindsay and Ware; NDF—Breanna Brown (W) and Meredith McDonald. Highlights: NF—Mangan had two hits. NDF—McDonald had three hits. Claire Tesky hit a two-run double. Brown struck out 10. Records: Masuk 5-0, Fitch 1-5. Batteries: M—Madison Procyk (W) and Montana Killoran; F—Ellie Hohlfelder (L), Allison Georgetti and Karly Morales. Highlights: M—Procyk struck out 11 and also went 2-for-4, including a double, with seven RBIs. Samantha Schiebe went 3-for-5, including a triple, with three RBIs. Emily Lange went 4-for-4. F—Morales, Alyson Cabral and Emelie Pope each singled. Scoring: S—Nick Pagliuso 5 goals, 2 assists, Nick Pavone 1g, 5a, Jared Sedlock 2g, 1a, Jake Oddo 2g, Ben Peters 2g, Victor Zelaya 2g, Jack Carr 1g, 1a, Reilly Brennan 2a, Casey Brennan 1g, Connor Greene 1g, David Yakowicz 1g, Tyler Pjatak 1a, Cole Krajscik 1a; L—Tyler Edwards 1g, Cam Ferguson 1g. Goalies: S—Daschel Kline (2 saves), Isaiah DeLoatch (3); L—Josel Galendez (18). Shots: S—36; L—7. Records: ND-Fairfield 0-6, Housatonic Regional 3-2. Scoring: NDF—Jenna Sabia 7 goals, 2 assists, Nora Hagerty 2g, 4a, Jailyn Ballester 2g, 2a, Herla Monrose 3g, Olivia Ramos 2a; HR—Genevieve Bushey 9g, 2a, Abigail Dodge 2g, 2a, Maggie Rafferty 2g, 1a, Maebel Spencer 1g, Josie Marks 1g. Goalies: NDF—Janelle Rosales (22 saves); HR—Annabelle Kovac (9). Shots: NDF—27; HR—39. (at Foran): singles: Ryan Money (F) def. Chris Hilton 3-6, 6-3, retired; Will Weinbach (FP) def. Nico Esposito 7-5, 6-3; Charlie Youngs (FP) def. Connor Rowe 6-2, 6-3; Bobby Rolando (FP) def. Petie Mata 6-2, 6-2; doubles: Kyle Barry/Ethan Fabro (FP) def. Danny Abate/Eric Levesque 6-0, 6-0; John Godino/Patrick Kelly (FP) def. Jon Hannon/Jared O’Sullivan 6-0, 6-0; Finn Hublitz/Griffin Harding (FP) def. Kevin Huang/Patrick Semana 6-0, 6-0. Records: Fairfield Prep 2-3, Foran 2-4. (at Wooster): singles: Conner McDonald (GFA) def. Charlie Stuhr 6-1, 6-2; Jack Ramsay (GFA) def. Andrew Felton 6-1, 6-0; Jack Wolfshon (GFA) def. Brady Knuff 6-3, 6-0; Nick Simonsen (GFA) def. Parker Etzbach 6-2, 6-1; Albert Bostoen (GFA) def. Ben Everett 6-3, 6-3; Ben Everett (W) def. Mike Pratt 6-2, 6-4; doubles: Aidan Helfant/Sam Lublinsky (GFA) def. Felton/Knuff 8-3; Jordan Liu/Will Schadt (GFA) def. Stuhr/Nast 8-1; Sean Pratt/Owen Minson (GFA) def. Jerry Keefe/Max Porter 8-1. Records: Greens Farms Academy 3-0, Wooster 4-1. (at Weston): singles: Ally D’Aquino (W) def. Cally Higgins 6-1, 6-3; Elizabeth McCain (B) def. Rachel Finkel 6-3, 6-4; Lila Pocsik (W) def. Sophia Krzewicki 6-0, 6-0; Mariel Zech (W) def. Rachel Horowitz 6-0, 6-0; doubles: Annika Mirchandani/Haley Bailleux (W) def. Claire Lamb/Laurel Winslow 6-1, 7-5; Charlie Glick/Samantha Godwin (W) def. Kaela Klein/Victoria Koltchine 6-0, 6-4; Natalie Haythorn/Jordan Conlon (W) def. Hannah Tunick/Janelle Wargo 6-0, 6-1. (at Wolfe Park, Monroe): singles: Nuala Paudyal (B) def. Kathryn Conley 6-0, 6-1; Amanda Gage (B) def. Sophia Norton 6-0, 6-2; Sara Giardi (B) def. Margaret Kokorda 7-5, 6-3; Chloe Hurme (M) def. Nica Smith 6-3, 6-3; doubles: Shae Lepre/Alayna Boileau (B) def. Michelle Antony/Melanie Antony 6-4, 7-5; Ellie Bartlett/Sarah Berdon (B) def. Aarti Arasada/Neha Samuel 6-3, 6-2; Violet Carlson/Gillian Ciaccio (M) def. Kaylee Lam/Celina Shrestha 6-3, 6-2. Records: Branford 4-3, Masuk 2-3. (at Law): singles: Lucia Pino (L) def. Allie Galushko 6-0, 6-1; Monica Pydipati (L) def. Hamachi Igo 6-0, 6-0; Jenna Bagdasarian (L) def. Sarah Mathews 6-1, 6-1; Morgan Duffy (SHA) def. Bridget Sanchez 6-4, 6-1; doubles: Cambell Doyens/Jen Madu (SHA) def. Amelia Mower/Thea Ryan 6-0, 6-1; Emily Bierny/Nora Shannon (SHA) def. Diya Daruka/Sophie Maselli 7-6 (7-4), 4-6, 6-2; Brynn Costello/Meghan Loftus (L) def. Annie Mackey/Colleen Doyle 2-6, 6-2, 6-4. Records: Law 4-2, Sacred Heart Academy 0-5. Highlights: G—Whit Courage had 18 kills. Manuel Ortiz had 26 assists. SJ—Ian Argento had 12 kills. Tyler Higgins had 15 assists. Records: Kolbe Cathedral 3-3, Maloney 0-6. Highlights: KC—Jonathan Durant had 12 kills and 12 digs. Danny Ramirez had 14 digs and nine kills. Yves Thelusma had 17 assists. M—Greg Peruti had seven kills. Devin Juan had 16 digs. Records: Shelton 4-3, Hand 3-1. Highlights: S—Jack Gangi had four kills and two blocks. Brandon Acervida had six digs. Vinny Mallozzi had five digs, two kills and one ace. H—Matt McSweeney had 10 kills and seven blocks. Finn Sheehan had five kills and one block. Jonas Bizier had 21 assists and one kill.